This post is brought to you by Vilebrequin. As always, all opinions are mine. One of the things I always look forward to during the summer season is going to the beach, family summer vacation and all the fun activities that comes with summer. Before we start talking about back-to-school preparation for Nolan in few weeks, it is time for us to take a family summer vacation. Since I am planning our family summer vacation for next month, I though it will be ideal to share what I plan to get and things that I will be taking with me on vacation. If you are also planning your summer vacation and still not sure what to pack, I have you covered. Today, I am rounding up my must-have summer vacation pieces. 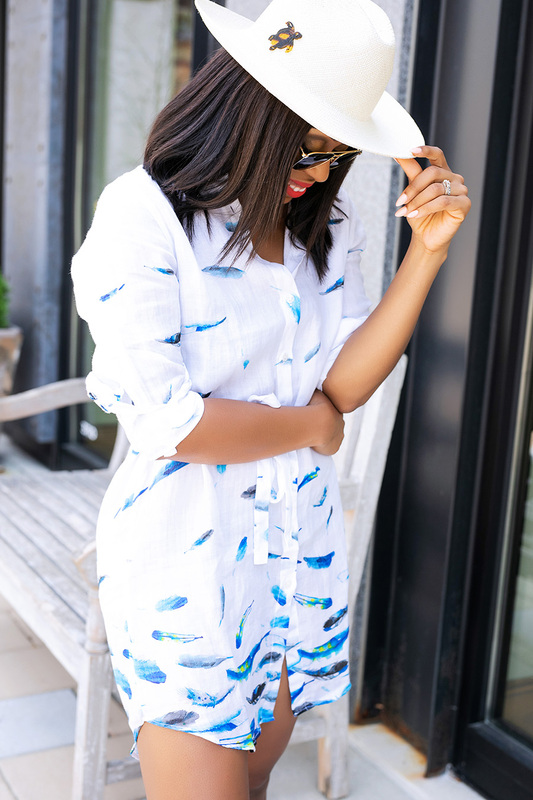 For my vacation style, I love keeping my looks comfortable, fun and stylish. I love pieces that embodies the destination and also items that I can restyle and wear from the beach to lunch or dinner. For my summer vacation, I will be taking a dress shirt, straw hat, sunglasses, swimsuit, cover up, small on-the-go bag and a scarf that also works as a cover up. Shopping for vacation items for the whole family has been made easier since discovering Vilebrequin. Vilebrequin pieces are where your effortless meets elegance and colorfulness. The quality of the products are beyond amazing including this Blue Breath Long sleeve dress shirt that I am wearing. It's definitely a piece that can work as coverup and also dress for lunch while on vacation. I also love that they have pieces that you can coordinate with your family members such as this halter dress for myself, this swim shorts for hubby and a matching swim shorts for Nolan.